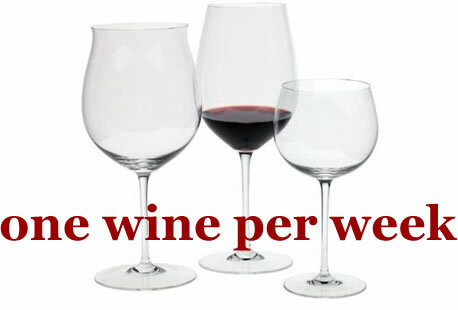 One Wine Per Week: Amazon.com Wine Club? The above is what came inside the box of something I ordered from Amazon.com. The order had nothing to do with wine; it was an M-Audio sound card for my computer so I am not sure how their marketers determined that people who buy a computer sound card would also be interested in wine. This reminded me of some earlier buzz on a few wine blogs as well as Decanter Magazine about Amazon.com adding wine to its vast selection of merchandise. Could this be what they were talking about? Well, I don't think so. This is not really Amazon.com but some company called 4Seasons that is really selling the wine, but it is being promoted through Amazon. It's a pretty attractive offer: 6 bottles of wine for only $29.99, plus $9.00 shipping. And for that, you also receive a free Screwpull-type corkscrew set and a binder to hold information cards. The catch is you are enrolled in a wine club that will send you a mixed case every 3 months, for a price of $119.95 plus tax and shipping. You can elect to skip shipments, if you want. And the introductory case has a money-back guarantee. And you can cancel any time, even after the intro offer. Please forgive the flash that shows on the pictures.. Anyway, I looked these up on Cellar Tracker and unless 4Seasons is using ringers to post reviews, the wines sound pretty decent - especially for $5.00 each. I noticed that several of the people said they had received these as part of a wine club shipment but had paid $10 for them. Now that doesn't seem like such a bad deal to introduce people to wine in an inexpensive way, and to give them a variety, also. I went to Amazon.com to search for this offer and while it is not something that is part of their store, it does come up as a sponsored link. I have no ties or interest to the 4Seasons company. I thought I'd write about it since the little mini-brochure that was inserted with my Amazon.com order piqued my curiosity so I looked into it a bit more. I also found a couple of online reviews, here and here. I haven't heard anything about an Amazon wine club. 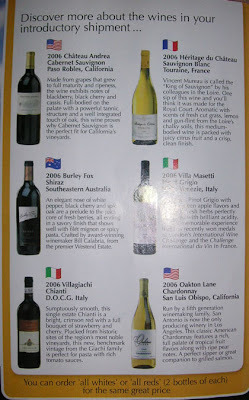 I also have a 4 seasons wine club review you should add to your article. 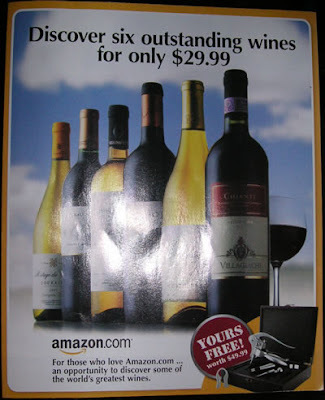 Amazon had arranged to sell wine on it's site about 2 years ago, through a distribution company in California. When the complex issues of which states allow shipping became apparent, Amazon bailed. I'm a fan of the 4 Seasons Wine Club, as well as their related ventures, Zagat Wine Club and the WSJ Wine Club. Reviews of these, as well as other wine accessories, are available on my website.